You’ve never encountered a towel this thirsty – guaranteed! I’ve been buying and selling microfiber towels for over twenty years, and I’ve never encountered a towel so thick and absorbent that jaws literally dropped upon first use. The Big Blue Microfiber Drying Towel, available in three different sizes depending on the size of your vehicle (or submarine, for that matter), absorbs so much water you will never have to wring it out. 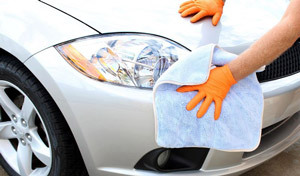 Even the smallest size is capable of drying a full-size family sedan without needing to be wrung out. I promise this will be the best microfiber drying towel you’ve ever used. With my history selling microfiber and working with the best factories all over the world, I know a thing or two about what makes a towel special. Big Blue, as we like to call it around the office, has all the features you would expect from a premium quality microfiber towel. Let’s go down the list, one-by-one if you will. The ultra-thick 1200 gsm Big Blue Microfiber Drying Towel is about 3 times thicker than a standard waffle weave drying towels! Big Blue is actually two towels, not one. What? That’s right. The only way to make a towel this thick and absorbent is by sewing two already massive, 600 gsm towels together. Big Blue weighs in at a hefty 1200 gsm! Korean Microfiber. Big Blue is constructed out of the highest quality microfiber Korea has to offer. To save costs, I had the final assembly of the towel take place in China. I wanted Big Blue to be affordable for common folk, after all! Silk banding. Every square inch of Big Blue’s design is 100% clear coat safe, even for black paint! The silk banding that outlines the towel glides over delicate surfaces without scratching. Use with confidence, even on black paint! Big Blue will not snag on emblems or sharp body lines, either. Unlike drying towels with aggressive, terry-like weaves, Big Blue glides across uneven surfaces without getting snagged. Big Blue makes drying your car, truck, SUV, motor coach, or boat a breeze. No longer will you have to go over each panel multiple times, wringing out the towel in between passes. A single pass with Big Blue will completely absorb all remaining water droplets that are on the paint after rinsing. Big Blue easily cuts your drying time in half, if not more. Say goodbye to water spots for good! The 26 x 18 inch Big Blue Microfiber Drying Towel is perfectly sized to easily maneuver around curved panels. 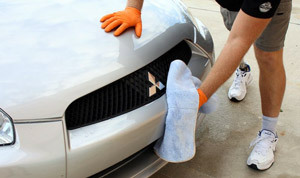 Big Blue Microfiber Drying Towel is cheap insurance for keeping your just-polished, swirl-free paint looking pristine. The 1200 gsm design makes it possible for Big Blue to be used exclusively with the “blotting method.” This technique is the best to avoid inflicting swirls and hairline scratches on darker colors. Like the name implies, you blot the surface dry, instead of dragging the towel. It sounds unorthodox, but it works incredibly well. I’ve sold hundreds, if not thousands, of different microfiber towels over the years and none of them come close to the performance of Big Blue. I guarantee it will be the thirstiest drying towel you’ve ever used. Over the years I have purchased many drying towels with money never being a concern as long I thought it was the best. Most of them were ok and some were way overpriced for what I received in the way of performance. Still looking for the best drying towel I purchased the Big Blue Microfiber Drying Towel, and words cannot describe how pleased I am. I dried an Acura MDX completely and never had to wring out the towel from start to finish. This towel just keeps absorbing water but never streaks or leaves any kind of lint. I have purchased from Autogeek for many years, and their products always excel, but this drying towel is an absolute standout. If you are searching for the most absorbent drying towel available try this one! Prosvery thirsty, and just keeps absorbing water. Very absorbent towels. Gentle on paint surfaces. The best drying towels I have ever used. Best drying towel I've used! Five stars from me is glowing praise, indeed. It takes a great product to blow me away. This towel is so thirsty, I've changed my drying technique. I now blot my car dry, and this towel makes it easy. Once the towel has enough water absorbed in it to have some weight, I hold it by two upper edges, (like a bull fighter!) and lay it into the vertical panels, gently slapping the paint. Then I wring it out, fold it up, and blot out recessed areas like around the license plate. Follow up with a quick detailer, and I'm done. It took me almost as long to type this as it takes me to dry with this method. I need to work on my typing speed. Next to a blower, there's no safer way to dry. ProsThick and thirsty. Ultra soft fibers. ConsI now have a bunch of waffle weave towels that I will have to save areas that are too messy to use this gem on!